Bforex – an excellent quality of services and profitable quoting rates favorable for the experienced traders as well as for the novices. Bforex Company has a wide line of offers for the legal bodies starting from agreements with institutional broker and including engineers of White Label. I opened an account at Bforex in 2015 with $5000 capital. My trading actions went smoothly because their platform performs well. They also have a wide range of platform choices that caters to various preferences. I was able to earn steady profit and decided to make a partial withdrawal in March 2016. At that time, my account wasn't verified so I still had to submit the documents. But after submitting, the process only took a few hours so my withdrawal request was processed on the same day. Then I received it the following day. I have trade with Bforex in a mini MT4 Trading Account. Really I enjoyed their MT4 platform, which has fast execution in the market. So my orders always opened at accurate position or where I want to set. I have used an EA too, which give me $50 so far. Honestly, I never had any technical problem with them or I hadn't any financial issue on my withdrawal via Skrill account. Their payment is proceeded within 4hours after requesting. So I satisfied in the Bforex platform. Bforex is really a great broker. It has fast execution of trades, and the withdrawal process is so quick I had made 2 withdrawals this month through wire transfer and the withdrawal is quick. Bforex is my broker since 10 months ago and I find them very professional and honest. I'm amazed at how their platform work and they give traders big bonus and nice trading commission. I start with minimum initial deposit of $100 and in more then a month I am using their platform, I making a profit average about 20% to 35% into my account. I request for withdrawal of 50% from the profit out of my profits through wire transfer, which was fast and easy. Every section is well-done they are really honest broker! I started to trade with BForex the past 3 months. I am a newbie and this broker provides all the information I needed to start trading. My first deposit was 100$ and I like that I can trade a small lot of 0.1. Till now I have a profit of 50-80$ a month, but at least I am not losing money. I trade currency pairs EUR/USD, USD/CAD and GBP/USD. 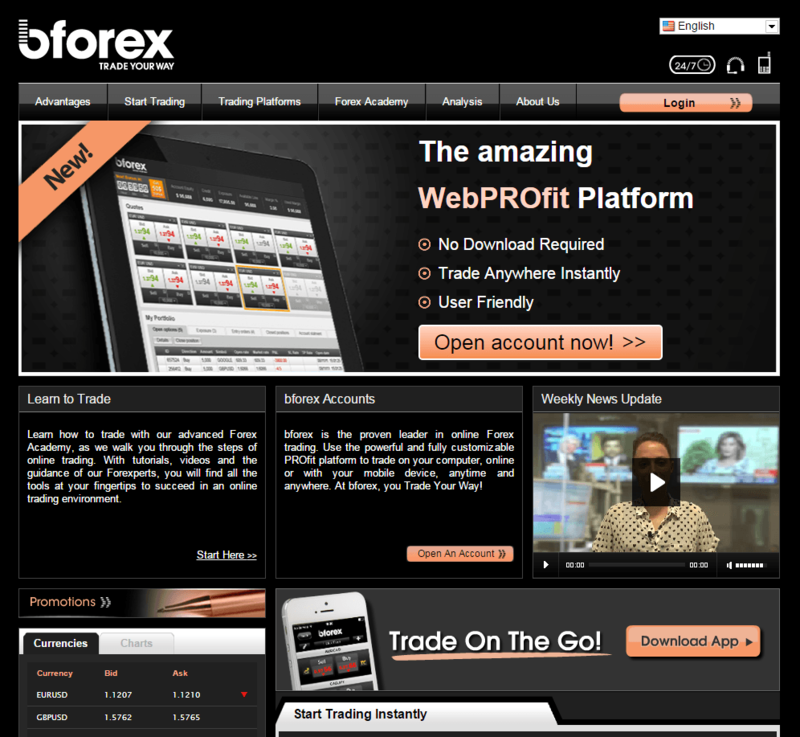 I really like bforex's trading system due to the best service and transparency. I liked the platform MT4 especially now that it gets so much better. I could see that there´s no commission for deposits. For me they are a reliable broker. for 3 year trading with bforex, I can saya that there are reliable broker that provide good trading condition for me during trading activity. They provide me good trading condition that stable to run and they also have a good speed execution that take my order instantly after I click the order button. In addition, they also have a good spread start from 3 pips for major pair and the initial deposit also still affordable for newbie to make deposit and try their systems. I also like their website that provide me good trading information such as technical analysis, economic news and also educational sites for newbie. Every month I will made a withdrawal for 500 USD via credit cards and it only took around 3 days to complete the transaction. Bforex is a recommended and reliable broker from me. i have tried so many brokers before in the past years and didn't succeed but when my friend introduce Bforex, I did researched and tested their demo. It was good and I really like the tools that they offer. After several months of demo testing, I opened a live account with initial deposit of $50 via Mastercard which I am continuing to grow nicely.. Now possibly the best thing this broker has is it's customer service as they are more than just troubleshooting, they give training courses in basic strategies to work in the real market but they also assign someone to keep in regular contact through mail and even phone monitoring your accounts and giving feedback about how to improve your trading. I withdrew my money after a month of trading with 80USD profit (did just a few trades per week). Received my money next day on my bank account. I've had only positive experience with this broker. I am very grateful to them. All services offered by Bforex are fast, specially withdrawals process, it's very competent and trustworthy. I joined Bforex in 2015 because I like their trading platform. Using this platform really help my order execution and some trading tools are pretty good for me, the execution is fast and the prices are real. My deposit and withdraw process are easy by the with WebMoney system and it takes in less than 3 days. Sometimes I had a problem with some closed positions during the night, but I didn't worry because the support team helped me easy and fast response. Bforex are honest and reliable broker, I recommend them to my all friends. This is the first review that I ever made, but it is important that people should know my experience. I spent some time writing this. I have used this broker for several months now and no issues whatsoever. Their service is incredible for an online brokerage, and I am not the easiest person to deal at times. The support was really great because the issues I have had have largely been related to my own ignorance of how a true ECN works and they have offered to phone me or actually have whenever I have had an issue, and done so promptly. What impresses me he most is their fast execution, spreads and client service. I very much feel that they are an honest and transparent broker. Last week I pulled out some of my profits and that was fast also, I submitted a withdrawal and received confirmation within 3 hours that it was processed, the money was in my account the next day using Neteller. Highly recommended and not just for professional traders.